Cloud-based tools can provide schools with a number of benefits. It seems like everywhere I go, people are talking about cloud computing. Most of us use the cloud on a daily basis: We log into email accounts, go to Amazon or use other web-based services. The move to the cloud is happening in education too. We are just beginning to see what benefits can be reaped from this emerging technology, as professors across the United States and Canada deliver coursework to their students through cloud-based classroom software. The potential for cloud technology can go far beyond that, however, and higher ed professionals are taking notice. Faronics partner CDW recently released their annual “State of the Cloud” report, a comprehensive survey of more than 1,200 IT professionals from various industries. Researchers were interested in discovering why people were migrating to the cloud and what services they were using. According to EdTech Magazine, organizations were mostly motivated by the cloud’s ability to increase productivity, as well as their desire to increase efficiency, mobility and innovation. 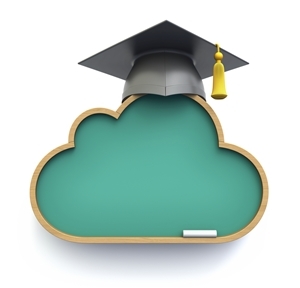 What’s driving universities to the cloud? When asked what types of services they were moving to the cloud, higher education IT professionals cited storage the most. With all the data schools compile, including financial records and student academic histories, it’s cheaper and easier to store that information in the cloud. In addition, cloud networks allow for quick, remote access and save costs on server maintenance. Schools also use the cloud for email so that student can access university email accounts and instant messaging services from their mobile devices and computers. Additionally, cloud servers allow educators to create unique teaching materials that students can access on their mobile devices. Administrators can use the cloud to create applications that help students adjust to college life. What services are colleges moving to the cloud? The growth of cloud adoption among colleges will no doubt continue. As mobile devices become more standardized with students and faculty, cloud-based classroom software can be used to engage students and deliver course materials. We are approaching the day when college students everywhere will be able to access their syllabi, texts and exercises quickly and conveniently on their phone, tablet or computer. With so many potential uses for the cloud, schools should be taking advantage of it every chance they get. What do you think about the methods universities have devised to use the cloud? How else can it be used to make the classroom experience better for students? Tell us what you think in the comment section below – and remember to message us on Facebook!